Wind 10 turns of lead weight, 12 of nonlead. Push into bead. Tie on thread, wind down to bend, coat with head cement. Tie on small pinch of hand-stacked chartreuse calftail. Wrap a little down bend—to make hook float upside down. Tail should be 1/2 hook length, about 1/2 inch. Tie in two doubled pieces of flash, running down sides of tail. Tie in silver mylar tinsel, 6 turns (about 1/4 inch) and wind up to bead. 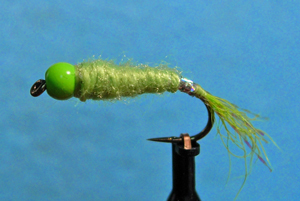 Tie in Danville thread, wind down to mylar and back, making tapered body, and ending against bead. Whip finish, Coat thread with head cement.